Non vi anticipo nulla, fate un salto qui. Next level fap. M thru F: Nerdiest Protester Ever: "
Check for your boss before visiting M Thru F! Audio Conferencing | Mikogo: "Free Web Conferencing and Desktop Sharing"
To make a Chromebook of your own is fairly easy and involves just a few simple steps.1. Download Google’s latest Chrome OS Vanilla build for USB HERE.2. Use Winrar or 7zip to extract the ‘tar.gz’ file into ‘.tar’, then extract again to view the folder with the Chrome OS image (.IMG) file.3. Download Image Writer 0.2 HERE.4. Insert USB stick.5. Open Image Writer and select the extracted Chrome OS .IMG file. Also make sure the selected “Device” is the one for your USB stick (should be automatic).6. Select “Write.”7. Restart the computer and change initial boot drive to USB so that it boots in USB mode.8. Finally, log in to Chromium OS with your gMail username and password or “facepunch” for both if you don’t have one. I recommend setting up a gMail account if you don’t have one already so that you can maintain and save your settings, documents, etc..
Google News Badges: "Google News added a feature that could encourage users to read more: collectible badges. 'The U.S. 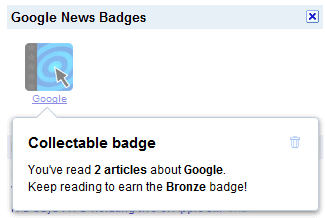 Edition of Google News now lets you collect private, sharable badges for your favorite topics. The more articles you read on Google News, the more your badges level up: you can reach Bronze, Silver, Gold, Platinum, and finally Ultimate. Keep your badges to yourself, or show them off to your friends,' informs Google. Google created more than 500 badges, so it's very likely that you'll collect at least one of them if you visit Google News frequently. Badges reward people that constantly read articles on a certain topic, so you're more likely to receive a badge if you read 3-4 articles a day about Google than if you read 10 articles about Google every 3-4 days. Installing new Android Market 3.0.26 on Archos Gen8 devices: "
Google has recently announced a major 3.0 update for their Android Market. This new version gives you new ways to find great applications and games , purchase books and rent movies. This update will require Android 2.2 devices and will be deployed in the coming weeks. - you can download Android Market 3.0.26 APK and install it yourself. Installation procedure using ArcToolsThis part goes thru the procedure to install latest Android Market 3.0.26 on Archos Generation 8 devices. Please note that this is valid only on Archos Gen8 devices (Archos 28, Archos 32, Archos 43, Archos 70 and Archos 101 Internet Tablet). It has been tested on stock devices and does not require a specific firmware or root access to your tablet. Edge HD2 Mini PC is an HTPC that hides behind your TV: "